WIN An AllFancyDress.com Voucher in time for New Years Eve! 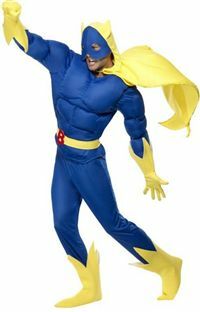 AllFancyDress is the UK’s leading online discount fancy dress retailer, with an fabulous array of fancy dress costumes that are ideal for any occasion and special event. They also stock a great range of accessories to match every fancy dress outfit found in the online store. She is known for creating new fashion trends, and with this costume you can follow suit. It's officially licensed and is the easiest way to get the ultimate celebrity look. Don't think I'd look too great in it mind! Share a few laughs this New Year and wear this hilarious Banana Man costume - even if it's not fancy dress! Everyone will be falling on the floor laughing as soon as you walk into the party wearing this. All the attention will be yours. And guess what, All Fancy Dress, are offering YOU the opportunity to win a costume of your choice.. well a £50 voucher to be precise. You will find an huge amount of costumes ideal for any occasion so what are you waiting for? Enter now! Competition closes at midnigh on 23rd December - that's it - good luck! You can also become a fan of All Fancy Dress on Facebook too- they give you a chance to win £5 off your order with their daily Facebook fiver competition.